September is the month six of our kids return to University. Three more start their freshman year. We need sponsors for these kids. Feel free to volunteer. Even a small amount helps. It also seems to be a make things beautiful month, adding to the playground in last months Newsletter. 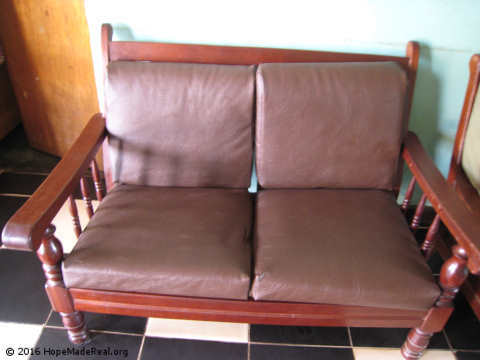 Covering the cushions in the boys house fits the category but the cushions were recovered because the material was warn so thin that the kids could dig holes in the material and play with the foam they removed. They thought it was fun but I remember when one of the kids put foam up their nose and it became a serious infection. It took some time to discover the problem. 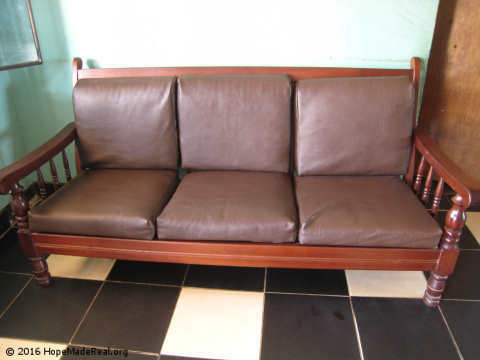 Better to recover the cushions. I think they look great. The material is washable with warm water and a cloth. What do you think? Improvement? I vote Yes! Now if you want cute, how about the new chairs for Day Care? Taking possession with an attitude. The children love them. They are just their size. 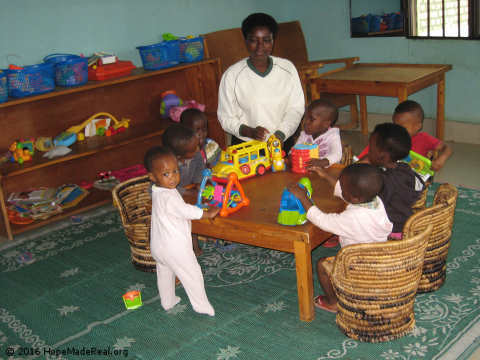 Chantel, Day care manager, appreciates having a play table and chairs where the kids do not set on the floor all the time. Better for her too. Four years ago, Soso was born at a local hospital. His mother had no money for a bed and was placed on a Moto before she was healed. Carrying her newborn son; she started home to her village across country on very bad rutted roads. When the driver reached her village it was discovered she had hemorrhaged all the way home and had died from loss of blood because she had not had time to heal, Soso is an orphan. He is a delight and a very active little boy. His name is Hildebrand but such a big name for a baby. He was nicknamed Soso by his sister Solange. The nickname stuck. Soso continues to enrich our lives at Urukundo Village. Soso was our very first Preschool dropout. 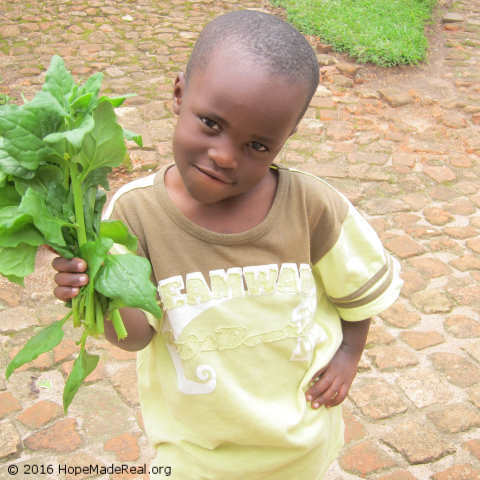 He was a very resourceful little 3-year boy who had decided he did not want to go to school. It took a bit of time for me to figure out what was going on. 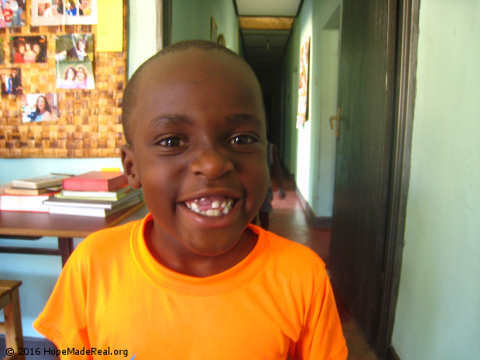 He had been so excited when he turned three because he could go to school but suddenly after the first day he decided school was not for him. For a week, we tried to deal with the problem to no avail. It occurred to me there was something else going on so I watched him during that week. He had the best of times not going to school. In the morning, he could play with the kids who went to Kindergarten in the afternoon and in the afternoon he played with the younger set after naptime. He didn’t need school to make his day perfect. Mama took steps. I went to talk to Soso and told him “It is ok if you don’t want to go to school. You do not have to go any more. You can stay home.” He was so pleased. That lasted one day, after an alone no play day he came to me and said “Mama, I want to go to school please.” Soso is in school and happy to be there. No preschool drop out. Soso graduated from Kindergarten in November 2016. He is now in Primary 1(First grade) and doing well. 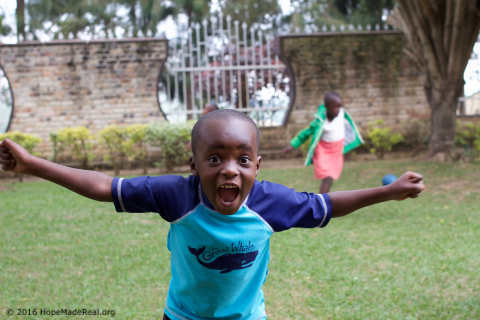 Soso’s greatest wish was to have a place to go to visit during holiday from school. Recently some extended family has been found and one member has accepted to have Soso during the school holiday. We are pleased that this has happened. Soso’s found relative Erneste came to meet Soso at Urukundo Village. We are hoping it will happen for other of our children. It is so good for children to have a connection. Look for an update on the bus project in next month’s newsletter. 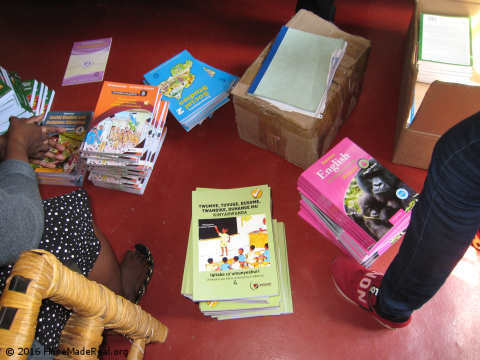 Those of you who have contributed to the education fund will be pleased to know we now have textbooks for all classes. This has been a goal for some time. How awesome is that? Books for Primary 1 – 5. We are blessed thanks to all of you. Next school year we will need text books for P6. 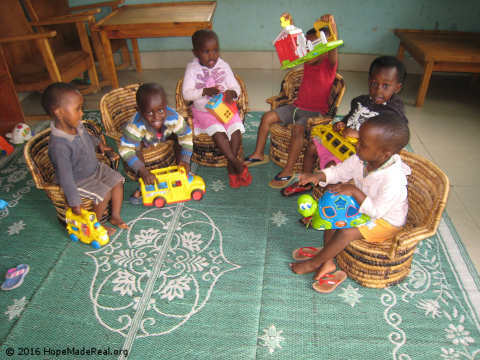 In January 2018, all 6 Primary grades will be in session at Urukundo Learning Center. This will be our first class to take the National Exam. How our children do in this critical exam will tell us if we are doing a good job. 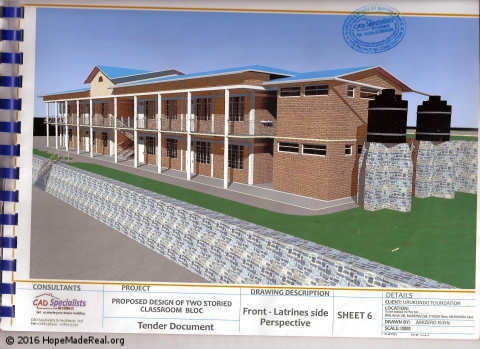 Our future looks bright as we have been given the go-ahead by the District to build and operate a Secondary School (High School) as part of the Urukundo Learning Center. More about that later. This is now in our 5-year plan. Ever on ward and up ward in education. Who knows maybe someday a University on the top of our mountain? Can’t wait to see that picture. Incentive works wonders so it was decided to give a small gift to each child in their class who were in the top 10 academically. 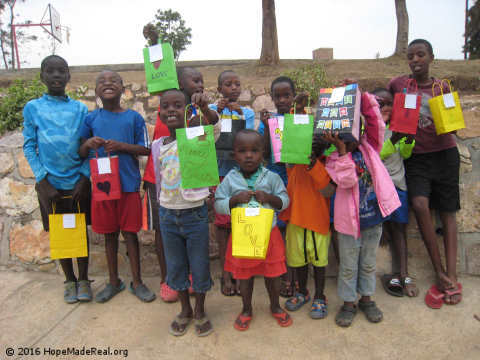 Each received a small bag with a gift inside. 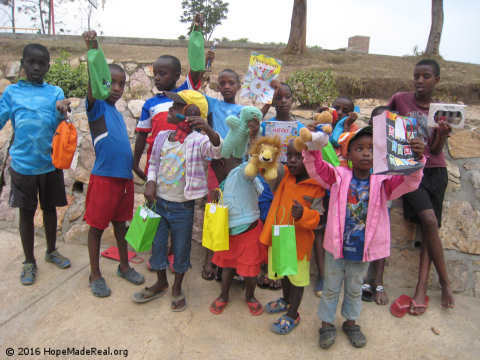 Gifts ranged from stuffed animals for the youngest to school supply kits for the older group. Next year, we will find another category for the prizes. Like most improved, best attendance etc. You get the idea. Rewards must not be only for the top achievers but must include those doing their best. Any suggestions for categories? Check out her message on the web site. 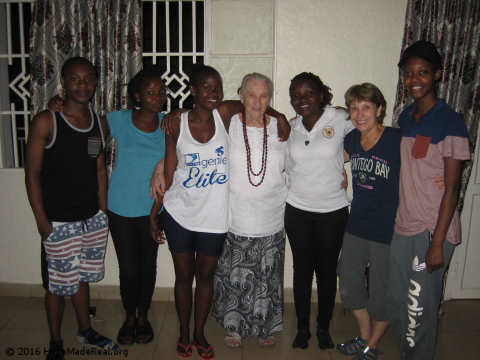 Jeanne Willis joins the teaching program at Urukundo Learning Center. 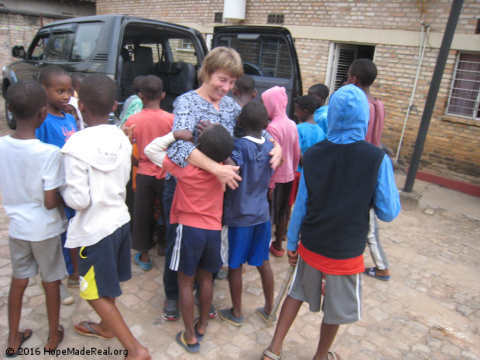 Jeanne hails from Pennsylvania and is returning for 3 months to volunteer at Urukundo Learning Center. Do read her message to you on the website. 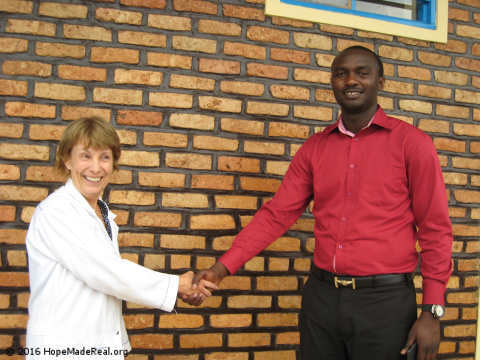 Welcoming Jeanne after more than a years absence was our Headmaster I’rene’s pleasure. Preschool teachers are excited to have Jeanne in their classrooms. New home for Electric Generator. 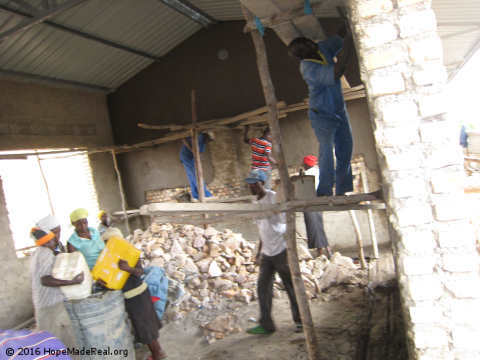 We thank God for Benjamin, our construction engineer and technician. If it can be built, he will build it. He is the best. Required for Dental program. It was necessary to meet regulations for us to build a home for the Generator. It now is housed in a small building of it very own. The generator supplies electricity for the Dental Clinic when power goes out. Who wants to be half way through a process have the power fail and wait 4 or 5 hours in the chair for the electricity to return? The generator saves the day. It kicks on as soon as the power goes and kicks off when it returns. Our dental Clinic operates very well. 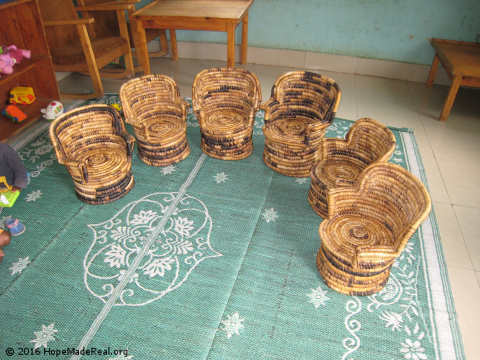 Rwanda is famous for being the land of a thousand hills. That is great but not for building. 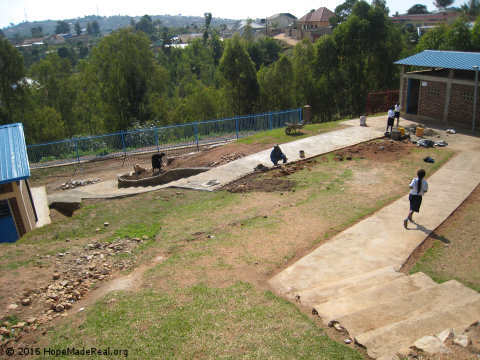 After you build you must add retaining walls to keep your building from moving down the mountain on its own. 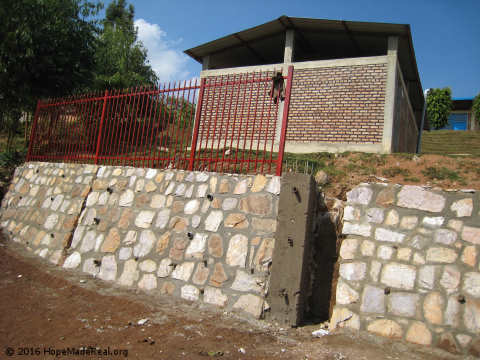 This wall is for the toilet at the Primary school. 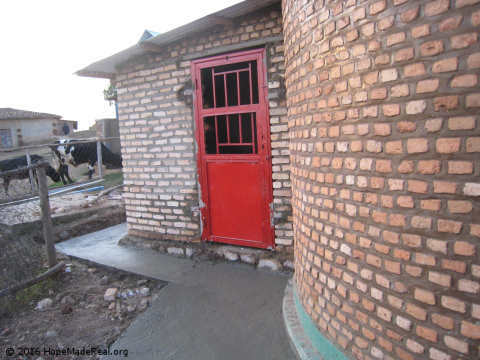 Funding for this building was donated by WOF (World Orphans Fund), we are so grateful for their support. 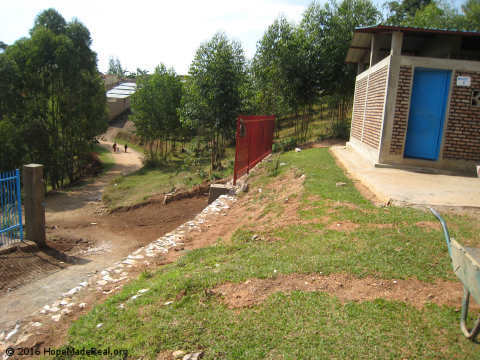 The fence is to protect the kids from a serious fall and maybe broken bones. We love and protect our students. The walk way is extensive but the building cares for both levels of the Primary school. 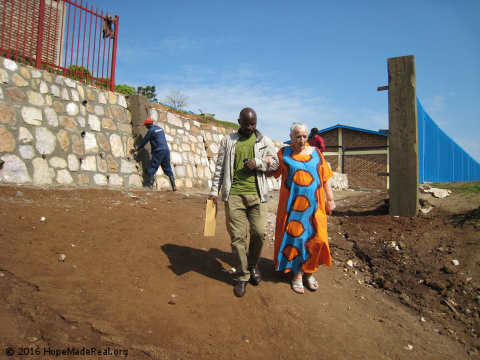 Oswalde escorts Mama on an inspection tour. It is good to have an arm for support. In line with our five-year plan, three classrooms are under construction and hopefully will be ready by January 2018. The two classrooms will facilitate our growing school population and one will be the new classroom for computer studies both for our students and adult classes for the community. The adult computer ICDL program under the direction and encouragement of Dr. Bob Dove is aimed at helping businesses in the area to better understand and us computer programs to their advantage. Dr. Dove and wife Amy will be residence of Urukundo Village in November 2017. We are excited to have them join our family. Amy will be an asset to our education program working directly with the school administration on curriculum and administrative problems. 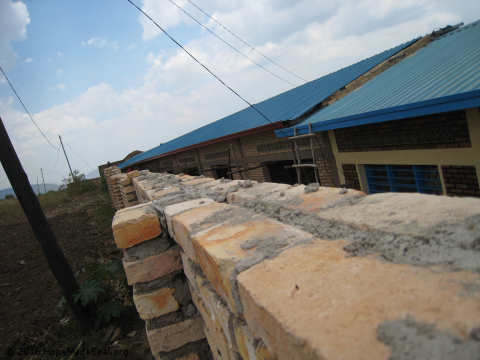 Building and roof completed on three classrooms. Inside work started. More work to be done. Cement walls, chalkboards, windows and doors, flooring (stones and cement), finishing work paint, décor and desks, and chairs. Then kids. Wow! Keeping you current, we now have 13 students in University. Two are in the USA. 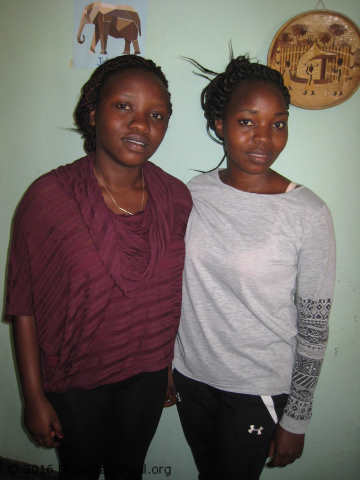 Nine in Kigali Universities and two are attending Gitwe Hospital School of Medicine. “BIG KIDS” not day care babies but just as cute. Some difference. 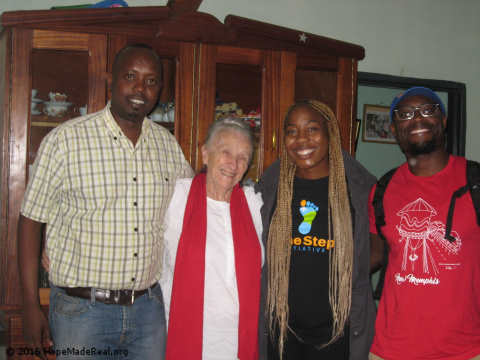 Cecelia and Pacifique (Dada) have moved to University house in Kigali. The girls started University in September. They are missed here at home. Study hard and do well girls. Deborah also started University in September. 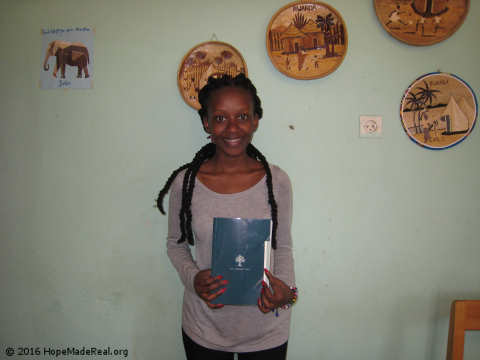 All our students receive an English bible upon finishing Secondary and before starting University. These bibles are gifts from donors in the US. Reading English and having an English Bible is special for Urukundo kids. We are delighted to welcome visitors who come for only the day. Brian Booker (glasses) from Tennessee and Jennifer PrudHome from California where a team brought to us by Yvan from GEI. The are representatives from “Onestep” Education is their priority. We had a delightful visit and they enjoyed the tour and lunch with the kids. Yes, our supplies of basic needs for babies nearly were depleted. Of course, I sent out the word. Thanks to your devotion to the Mama & Baby program! 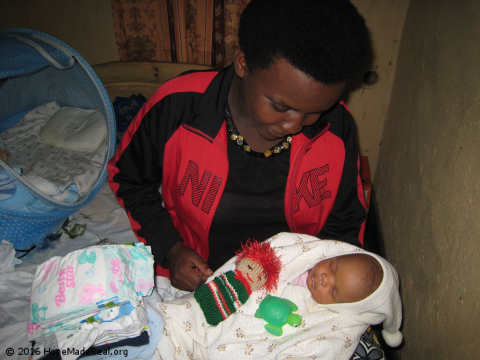 We are again able to supply mamas with much needed supplies for their newborn infants. I am so grateful. From our clothes closet when we can, we also send some clothing to other siblings in the family not wanting them to feel left out. We also give baby gifts to the newborn babies of our staff. Bona one of our male teachers became a father this month and is so proud. His first-born a boy. New papa’s need encouragement & love also. I am featuring his son and wife in this newsletter. Thought I would let you know how your donations for M&B are working to support Urukundo and the community. Thank you, all who love and care for babies and support this program.